In the distant future, humankind has been abandoned a dying Earth and relocated to the Balkan System a mere 150 light years away. A dainty pair of twin brothers, Thor and Rai, find themselves torn from a life of luxury, their parents murdered, and are abandoned to their fate on Chimaera, a savage, unexplored planet where the worst criminals are sent to die. Forced to fend for themselves against some decidedly unfriendly plant life (think Venus fly trap crossed with Charles Manson), the lads must also negotiate their way around warring clans in an effort to conquer all and become the Beast King, the only way of winning freedom from the cursed realm. A bit of revenge against the dastardly Prime Minister Odin wouldn’t hurt either. Combining Ursula Le Guin-esque flights of fantasy with unashamed environmental activism, this is one for anime fans who like their men pretty (in the best bishounen tradition) and their sci-fi with liberal lashings of social awareness. 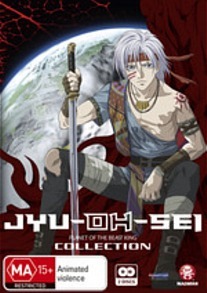 Though the complex themes competing throughout are occasionally denied the chance to really come to fruition, Jyu-Oh-Sei is nonetheless a competent, well-intentioned and visually arresting series, and another well-chosen anime import from Madman. References to Darwinism, paganism, feminist theory, racial inequality and social science make it mildly more cerebral than, say Initial D, and the myriad subplots ensure the series maintains its momentum to the last. There’s plenty of variation in the design of the series’ well-crafted characters, animation on the action sequences is fluid and backgrounds are uniformly lush and multi-faceted. This two-disc set features a 16:9 anamorphic widescreen transfer, with English 5.1 and Japanese 2.0 audio options. The lack of a Japanese surround soundtrack is unfortunate, and though the 2-channel proves mostly respectable for those who prefer to watch anime in its native tongue, it still falls a little flat in places. Principal here is an audio commentary by the English voice cast on Episode Six. Also included are original commercials, several textless songs (the opening is particularly noteworthy) and the usual array of trailers. Fairly standard, but the commentary provides a few lively insights into the recording process and other behind-the-scenes titbits.